I have just come back from a short visit to the medieval town of Mirepoix in Southern France. 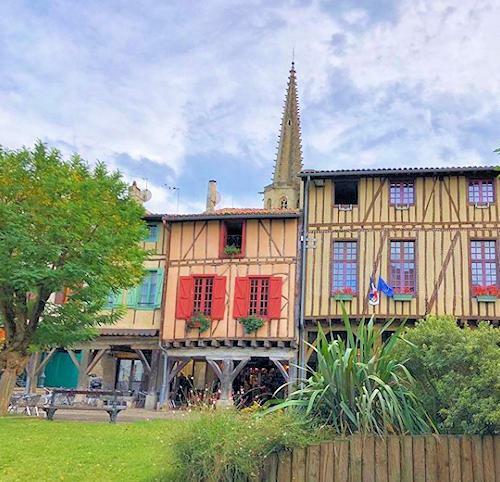 I have been to Mirepoix a couple of times before, once when it was the Monday market day and another time when I was having lunch with clients. But I have never spent a lot of time exploring around. After spending a good few hours walking around the town, I have to say I am really impressed with Mirepoix and I would certainly recommend that you take a detour to visit the place. The central Place Marechal Leclerc in Mirepoix is certainly the most beautiful square I have seen in France and there are some really interesting shops in the narrow grid of streets around the main square. I think that the town of Mirepoix is a lot like some of the other really pretty places in Southern France - Lagrasse, Pezenas, Sommieres, Uzes - they are all remain beautiful towns because either not much has ever really happened to them so they have kept their medieval features in tact or they have been subject to one catastrophic event in the past and then redesigned. With Mirepoix, it is a combination of the two. The original town was wiped out when the river flooded the town. The town was then moved to higher ground and rebuilt in the late 13th Century according to a grid pattern layout. Mirepoix was originally a Cathar stronghold, but the local inhabitants suffered the same fate as their neighbours in Carcassonne and Beziers, when the crusade led by Simon de Montfort hit the region (see The Cathars in Languedoc for more information). The St Maurice Cathedral in Mirepoix dominates over the town. It seems strange that a town of only 3,000 people has such a large cathedral. The cathedral in Mirepoix is purportedly the widest church in France and you can easily see why it took over 600 years to complete. The cathedral was substantially repaired in the mid-nineteenth century by the same architect (Eugène Viollet-le-Duc) who restored Carcassonne castle. Mirepoix holds its main market every Monday in the main square (Place Marechal Leclerc). The market really does consume the whole town and the population of the town doubles on market day. Even though there are plenty of car parks in Mirepoix, it can be quite tricky to find a parking space when the market is on. Whenever we have visited the market, we have always parked down by the rugby stadium. It is a bit of a walk into town, but it saves you having to drive road looking for a space. 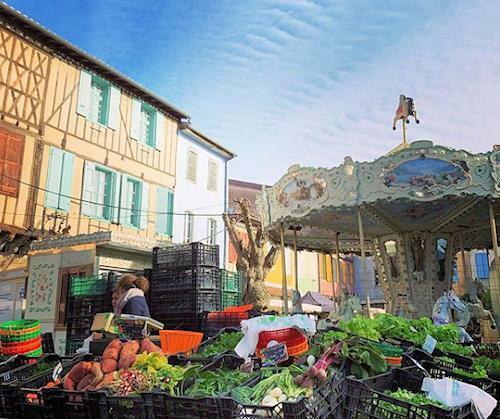 The Monday market in Mirepoix offers everything from locally produced foods, beers, wines, fruit & veg, clothing, artisan soap, flowers and everything in between. You can even get your knives sharpened by a craftsman with a special stone wheel. When we stayed in Mirepoix, the owner of the B&B said that the Fish van is the best supplier of fresh fish in the area. She also recommended the goats cheese stall, which is produced by a farmer from the nearby Ariege region. On market day you can still get something to eat or drink, but the cafes and restaurants on the edge of the Square do get very busy. There is also a smaller Bio market in Mirepoix, held every Thursday in the Market Hall in front of the cathedral. Certainly if you look at the Tripadvisor reviews of the restaurants in Mirepoix, they all seem much of a muchness. But I have eaten twice at La Saint Maurice restaurant right in the market square of Mirepoix and I have been impressed on both occasions. The menu is definitely typical of South West France, with a lot of duck and Cassoulet, but there are also some surprising twists, like wild mushroom risotto. The landlady of the B&B we stayed at also recommended the restaurant at the Hotel Mirepoix Relais and the Petite Bouchon restaurant (although she did say that this can either be excellent or average depending on the mood of the chef). We also picked up a couple of other tips from Tripadvisor - La Grain de Sel and L'Autre Jardin. Unfortunately, both were closed when we stayed (it was a Wednesday night at the end of October). 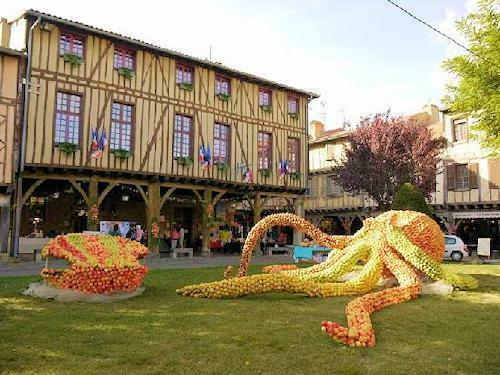 During the Autumn, Mirepoix is decorated with large sculptures, made out of the locally produced harvest of apples. The Mirepoix Fete de Pomme festival takes place during the second weekend of October. Mirepoix is located in the Southern France, just a short drive south west of Carcassonne. It is located in the Ariège department, (part of the Occitanie region) just above the Pyrenees. To reach Mirepoix, you can take the A61 motorway from Carcassonne to the town of Bram and then follow the D119 down to Mirepoix. It is a very pretty drive and the road offers plenty of views of the Pyrenees mountains in the distance.